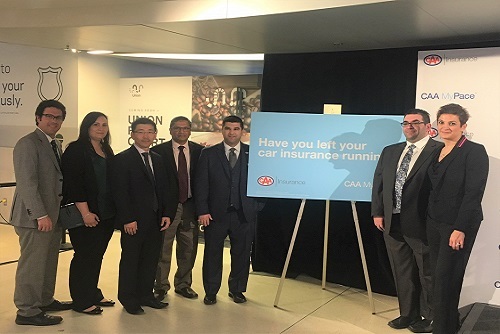 Amid the hubbub of a busy morning in Toronto’s Union Station, CAA Insurance announced the roll out of Canada’s first-ever, pay-as-you-go auto insurance program. With CAA MyPace, drivers in Ontario will have the option to pay for their auto insurance in 1,000-kilometre increments. Those who sign up will be charged a base rate, after which they’ll pay every time they hit that kilometre milestone, up to 9,000 kilometres, when the pay-as-you-go charges will equal what the driver would pay under a standard auto insurance program. At this point, they will not be charged for further increments. This new form of insurance is a departure for not only the country, but the organization. The program “puts consumers’ needs first,” added Turack, and uses a telematics device provided by Octo Telematics that each MyPace customer will get free-of-charge to plug into their cars. While much work has been put into tracking driving behaviour using telematics devices, the CAA program will not monitor how hard a driver is braking, for example, and will only focus on tracking mileage. The program is ideal for motorists who don’t hit the road often. This covers a broad scope of lifestyles, from retired seniors who use a car on a weekly basis to daily commuters, like those swarming train and bus stations every morning. CAA is currently training its brokers on the program, which will go into effective in the summer. An online portal and CAA app will also allow the user to track their mileage, though they’ll get notifications either way when they’re close to hitting another 1,000 kilometre mark and once they surpass each increment. Whether it’s a family with two cars that uses one more than the other or a millennial who only drives during sporadic weekend trips, MyPace is based on the premise that drivers should have some control over what they spend on their insurance, especially if they don’t drive often. “Auto insurance is not a one-size-fits-all solution,” said Silverstein.